If you’ve browsed the internet in the past couple of years you’ve most likely seen ads for the miracle weight loss acai berry diet. This is just another fad diet in a long line of fad diets. However, acai berries are a legitimate superfood that pack a huge nutritional punch and are an excellent smoothie ingredient. Acai (pronounced “ah-SAH-ee”) is a little blue/purple berry native to the Amazon rainforest. 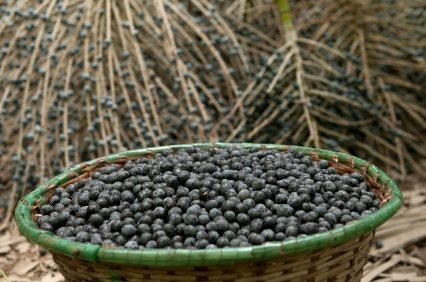 The berries come from acai palms, which are tall, slender, and range from 15–30 meters. Amazonian natives have been consuming acai for centuries because of its legendary health properties. These phenomenal health properties are becoming more well known and mainstream (acai landed on Oprah Winfrey’s Top 10 Superfoods list). Antioxidant Powerhouse: Acai ranks near the top of the ORAC scale, containing more antioxidants than blueberries, red grapes, and pomegranate. Minerals & Vitamins Galore: contains a wide variety of minerals and vitamins and is particularly high in calcium, phosphorus, beta-carotene, and vitamin E.
Combine acai with mango and banana and you’ve got a great tasting, highly nutritious smoothie! Place all the ingredients into your blender and blend for around 30-45 seconds or until nice and smooth. Please leave a comment below if you try this acai mango smoothie. Happy Blending! For the most nutritious form of acai, make sure to use frozen acai purees. Look for purees (aka acai pulps) that don’t have soy lecithin and have at least 3 grams of fiber per serving. Freeze-dried acai powders are the next best bet, but the juices have very little of the super nutrients that the purees possess due to a thawing out process and diluting process that strips the nutrients out of the purees when they make the pulps. After all, the acai juices are just watered down purees and the reprocessing of them so they can be bottled is just too damaging to the fragile antioxidants in acai. Hi Brandon, thanks for the insightful and informative comment on acai. You definitely want to get the most bang for your buck when consuming acai and the frozen purees are where it’s at.